Presenting your message or communicating information - the graphic impact of your envelope drives the interest of the receiver to open it immediately or "file it". In today's world of information overload, only the high impact package gets high priority attention. See the impact - request a free sample. Beyond the graphic appeal, your Alert Security Mailer can be custom built with any of the security features of the Alert Security Bag. This includes Standard or Maximum Security "void" tape closures, serial numbers and receipts. And the Alert Security Mailer comes in the easy to use continuous roll form. 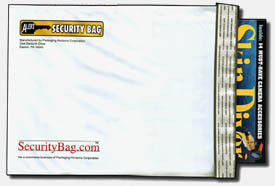 Review the security options on our Security Bag Features page. Our customer service representatives can assist you in the design of your custom Alert Security Mailer. E-mail, fax or call for design assistance and quotation.